The French invasion of Russia (also known as the Russian Campaign) in 1812 was a turning point in the Napoleonic Wars. The campaign reduced the French and allied invasion forces to a small fraction of their initial strength. Its sustained role in Russian culture may be seen in Tolstoy's War and Peace and the Soviet identification with it during the German invasion of 1941-1944. Napoleon's invasion is better known in Russia as the Patriotic War (Russian Отечественная война, Otechestvennaya Vojna), not to be confused with the Great Patriotic War (Великая Отечественная война, Velikaya Otechestvennaya Voyna) which refers to Hitler's, rather than Napoleon's, invasion of Russia. The Patriotic War is also occasionally referred to as the "War of 1812," which is not to be confused with the conflict of the same name between the United Kingdom and the United States. In an attempt to gain increased support from Polish nationalists and patriots, Napoleon in his own words termed this war the "Second Polish War" (the first Polish war being the liberation of Poland from Russia, Prussia and Austria), because one of main goals of this war was resurrection of Polish state on territories of Lithuania, Belarus and Ukraine. The "first" Polish war was the War of the Fourth Coalition to liberate Poland from Russia, Prussia and Austria). One of the official declared goals of this war was the resurrection of the Polish state on territories of the former Polish-Lithuanian Commonwealth. Tsar Alexander found Russia in an economic bind as his country had little in the way of manufacturing. Although rich in raw materials, Russia was part of Napoleon's continental system which denied it the trade that was its lifeblood for both money and manufactured goods. Russia's withdrawal from the system was a further incentive to Napoleon to force a decision. Napoleon and the Grande Armée had developed a proclivity for living off the land that had served it well in the densely populated and agriculturally rich central Europe with its dense network of roads. Rapid forced marches had dazed and confused old order Austrian and Prussian armies and much had been made of the use of foraging. In Russia many of the Grande Armee's methods of operation worked against it. Forced marches often made troops do without supplies as the supply wagons struggled to keep up. Lack of water, lack of food, and a thinly populated and much less agriculturally dense region led to the death of horses and men, weakening them from lack of food, exposure to waterborne diseases from drinking from mud puddles and rotten forage. The front of the army would receive whatever could be provided while the formations behind starved. Napoleon made extensive preparations for provisioning his army. Seventeen train battalions of 6000 vehicles were to provide a 40-day supply for the Grande Armée and its operations, and a large system of magazines were established in towns and cities in Poland and East Prussia. At the start of the campaign, no march on Moscow was envisioned and so the preparations would have sufficed. However, the Russian Armies could not stand singularly against the main battle group of 285,000 men and would continue to retreat and attempt to join one another. This demanded an advance by the Grand Armée over a road network of dirt roads that would dissolve into bottomless mires, where deep ruts in the mud would freeze solid, killing already exhausted horses and breaking wagons. As the graph of Charles Joseph Minard, given below, shows, the majority of the losses to the Grand Armée were incurred during the march to Moscow during the summer and autumn. Starvation, desertion, typhus, and suicide would rob the French Army of more men than all the battles of the Russian invasion combined. On June 24, 1812, the Grande Armée of 690,000 men, the largest army assembled up to that point in European history, crossed the river Neman and headed towards Moscow. A central strike force of 250,000 under the emperor's personal command. Two other frontline armies under Eugène de Beauharnais (80,000 men) and Jérôme Bonaparte (70,000 men). Two detached corps under Jacques MacDonald (32,500 men, most of them Prussian troops) and Karl Schwarzenberg (34,000 Austrian troops). A reserve army of 225,000 troops, important parts were staying in Germany and Poland. In addition 80,000 National Guards had been conscripted for full military service defending the imperial frontier of the Duchy of Warsaw. With these included total French imperial forces on the Russian border and in Russia came to almost 800,000 men. This vast commitment of manpower severely strained the Empire—especially considering that there were a further 300,000 French troops fighting in Iberia and over 200,000 more in Germany and Italy. [Georges] Lefebvre says that Napoleon crossed the Neman with over 600,000 soldiers, only half of whom were from France, the others being mainly Germans and Poles. Felix Markham thinks that 450,000 crossed the Neman on June 25, 1812, of whom less than 40,000 recrossed in anything like a recognizable military formation. Richard K. Riehn provides the following figures: 685,000 men marched into Russia in 1812, of whom around 355,000 were French; 31,000 soldiers marched out again in some sort of military formation, with perhaps another 35,000 stragglers, for a total of less than 70,000 known survivors. Whatever the accurate number, it is generally accepted that the overwhelming majority of this grand army, French and allied, remained, in one condition or another, inside Russia. Adam Zamoyski estimated that between 550,000 and 600,000 French and allied troops (including reinforcements) operated beyond the Niemen, of which as many as 400,000 troops died. M. Minard's infamous graphic depicts the march ingeniously by showing the size of the advancing army, overlaid on a rough map, as well as the retreating soldiers together with temperatures recorded (as much as 30 below zero celsius) on their return. The numbers on this chart have 422,000 crossing the Neman with Napoleon, 22,000 taking a side trip in the beginning, 100,000 surviving the battles en route to Moscow, and of the 100,000 departing Moscow, only 4,000 surviving joined up by 6,000 that survived that initial 22,000 in the feint attack northward, to leave only 10,000 crossing back to France out of the initial 422,000. The First Western Army under Barclay de Tolly numbered 104,250 men and 7,000 Cossacks with 558 guns. The Second Western Army, under Prince Bagration numbered 33,000 men and 4,000 Cossacks with 216 guns. The Third Army of Reserve, under Cavalry General Tormassov, numbered 38,000 men and 4,000 Cossacks, with 164 guns. These forces, however, could count on reinforcements from the second line, which totaled 129,000 men and 8,000 Cossacks, with 434 guns. Thus, the grand total of all the forces was 488,000 men, of which about 428,000 gradually came into action against the Grand Army. This bottom line, however, includes more than 80,000 Cossacks and militiamen, as well as about 20,000 men who garrisoned the fortresses in the operational area. Sweden, Russia's only ally, did not send supporting troops. But the alliance made it possible to withdraw the 45,000 men Russian corps Steinheil from Finland and use it in the later battles (20,000 men were sent to Riga). 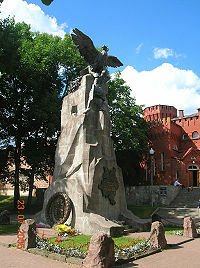 Eagles monument in Smolensk, commemorating the centenary of the Russian defeat of Napoleon. The invasion commenced on June 24, 1812. Napoleon had sent a final offer of peace to Saint Petersburg shortly before commencing operations. Receiving no reply, so he gave the order to proceed into Russian Poland. He initially met little resistance and moved quickly into the enemy's territory. The French coalition of forces was comprised of 449,000 men and 1146 cannon. They were opposed by the Russian armies composed of only 153,000 men, 938 cannon, and 15,000 Cossacks. The center of mass of French forces focused on Kovno and the crossings were made by the French Guard, I, II, and III corps amounting to some 120,000 at this point of crossing alone. The actual crossings were made in the area of Alexioten where three pontoon bridges were constructed. The sites had been selected by Napoleon in person. Napoleon had a tent raised and he watched and reviewed troops as they crossed the Niemen. The roads along this area of Lithuania were little more than small dirt tracks through areas of dense forest. They were plagued from the outset as logistics trains simply could not keep up with the forced marches of the corps and rear formations always suffered the worst privations. June 25 found Napoleon's group past the bridge head with Ney's command approaching the existing crossings at Alexioten. Murat's reserve cavalry provided the vanguard with Napoleon the guard and Davout's 1st corp following behind. Eugene's command would cross the Niemen further north at Piloy, and MacDonald crossed the same day. Jerome command wouldn't complete its crossing at Grodno until the 28th. Napoleon rushed towards Vilna pushing the infantry forward in columns that suffered from heavy rain then stifling heat. The central group would cross 70 miles in two days. Ney's III corps would march down the road to Suterva with Oudinot marching on the other side of the Vilna river in an operation attempting to catch General Wittgenstein's command between Ney, Oudinout, and Macdonald's, commands, but Macdonald's command was late in arriving to an objective too far away and the opportunity vanished. Jerome was tasked with tackling Bagration by marching to Grodno and Reynier's VII corps sent to Bialystok in support. The Russian headquarters was centered in Vilna on June 24 and couriers rushed news about the crossing of the Niemen to Barclay de Tolley. Before the night had passed orders were sent out to Bagration and Platov to take the offensive. Alexander left Vilna on June 26th and Barclay assumed overall command. Although Barclay wanted to give battle he assessed it as a hopeless situation and ordered Vilna's magazines burned and its bridge dismantled. Wittgenstein moved his command to Perkele passing beyond Macdonald and Oudinot's operations with Wittgenstein's rear guard clashing with Oudinout's forward elements. Doctorov on the Russian Left found his command threatened by Phalen's III cavalry corp. Bagration was ordered to Vileyka which moved him towards Barclay though reading the orders intent is still something of a mystery to this day. The thunderstorms of the 24th turned into other downpours, turning the tracks-some diarist claim there were no roads as in Lithuania-into bottomless mires. Wagon sank up to their hubs; horses dropped from exhaustion; men lost their boots. Stalled wagons became obstacles that forced men around them and stopped supply wagons and artillery columns. Then came the sun which would bake the deep ruts into canyons of concrete, where horses would break their legs and wagons their wheels. A Lieutenant Mertens—a Wurttemberger serving with Ney's III corps—reported in his diary that oppressive heat followed by rain left them with dead horses and camping in swamp-like conditions with dysentery and influenza raging though the ranks with hundreds in a field hospital that had to be set up for the purpose. He reported the times, dates, and places, of events reporting thunderstorms on the 6th of June and men dying of sunstroke by the 11th. The Crown Prince of Wurttemberg reported 21 men dead in bivouacs. The Bavarian corps was reporting 345 sick by June 13th. Desertion was high among Spanish and Portuguese formations. These deserters proceeded to terrorize the population, looting whatever lay to hand. The areas in which the Grande Armee passed were devastated. A Polish officer reporting that areas around him were depopulated. The operation intended to split Bagration's forces from Barclay's forces by driving to Vilna had cost the French forces 25,000 losses from all causes in a few days. Strong probing operations were advanced from Vilna towards Niemenczin, Michaliszki, Oszmiana, and Maliaty. Eugene crossed at Prenn on June 30th while Jerome moved VII Corps to Bialystok, with everything else crossing at Grodno. Murat advanced to Niemenczin on July 1st running into elements of Doctorov's III Russian Cavalry Corps enroute to Djunaszev. Napoleon assumed this was Bagration's 2nd Army and rushed out before being told it was not 24 hours later. Napoleon then attempted to use Davout, Jerome, and Eugene, out on his right in a hammer/anvil to catch Bagration to destroy the 2nd army in an operation spanning Oszmiana and Minsk. This operation had failed to produce results on his left before with Macdonald and Oudinot. Doctorov had moved from Djunaszev to Svir narrowly evading French forces, with a 11 regiments and a battery of 12 guns heading to join Bagration when moving too late to stay with Doctorov. Conflicting orders and lack of information had placed Bagration in a bind almost marching into Davout, however Jerome could not arrive in time over the same mud tracks, supply problems, and weather, that had so badly affected the rest of the Grande Armée, losing 9000 men in four days. Command disputes between Jerome and General Vandamme would not help the situation. Bagration joined with Doctorov and had 45,000 men at Novi-Sverzen by the 7th. Davout had lost 10,000 men marching to Minsk and would not attack Bagration without Jerome joining him. Two French Cavalry defeats by Platov kept the French in the dark and Bagration was no better informed with both overestimating the other's strength, Davout thought Bagration had some 60,000 men and Bragation thought Davout had 70,000. Bagration was getting orders from both Alexander's staff and Barclay (which Barclay didn't know) and left Bagration without a clear picture of what was expected of him and the general situation. This stream of confused orders to Bagration had him upset with Barclay which would have repercussions later. Napoleon reached Vilna on the 28th of June leaving 10,000 dead horses in his wake. These horses were vital to bringing up further supplies to an army in desperate need. Napoleon had supposed that Alexander would sue for peace at this point and was to be disappointed; it would not be his last disappointment. Barclay continued to retreat to the Drissa deciding that the concentration of the 1st and 2nd armies was his 1st priority. Barclay continued his retreat and with the exception of the occasional rearguard clash remained unhindered in his movements ever further east. To date the standard methods of the Grande Armee were working against it. Rapid forced marches quickly caused desertion, starvation, exposed the troops to filthy water and disease, while the logistics trains lost horses by the thousands, further exacerbating the problems. Some 50,000 stragglers and deserters became a lawless mob warring with local peasantry in all-out guerrilla war, that further hindered supplies reaching the Grand Armee which was already down 95,000 men. Barclay, the Russian commander-in-chief, refused to fight despite Bagration's urgings. Several times he attempted to establish a strong defensive position, but each time the French advance was too quick for him to finish preparations and he was forced to retreat once more. When the army progressed further, serious problems in foraging surfaced, aggravated by scorched earth tactics of the Russian army advocated by Karl Ludwig von Phull. Political pressure on Barclay to give battle and the general's continuing resistance (viewed as intransigence by the populace) led to his removal from the position of commander-in-chief to be replaced by the boastful and popular Mikhail Illarionovich Kutuzov. Despite Kutuzov's rhetoric to the contrary, he continued in much the way Barclay had, immediately seeing that to face the French in open battle would be to sacrifice his army pointlessly. Following an indecisive clash at Smolensk on August 16–8, he finally managed to establish a defensive position at Borodino. The Battle of Borodino on September 7 was the bloodiest single day of battle in the Napoleonic Wars. The Russian army could only muster half of its strength on September 8 and was forced to retreat, leaving the road to Moscow open. Kutuzov also ordered the evacuation of the city. By this point the Russians had managed to draft large numbers of reinforcements into the army bringing total Russian land forces to their peak strength in 1812 of 904,000 with perhaps 100,000 in the immediate vicinity of Moscow, or the remnants of Kutuzov's army from Borodino partially reinforced. Napoléon and General Lauriston—Peace at all costs! On September 14, 1812 Napoleon moved into an empty city that was stripped of all supplies by its governor, Fyodor Rostopchin. Relying on classical rules of warfare aimed at capturing the enemy's capital (even though Saint Petersburg was the political capital at that time, Moscow was the spiritual capital of Russia), Napoleon had expected Tsar Alexander I to offer his capitulation at the Poklonnaya Hill, but the Russian command did not think of surrendering. As Napoleon prepared to enter Moscow he was surprised to have received no delegation from the city. At the approach of a victorious General, the civil authorities customarily presented themselves at the gates of the city with the keys to the city in an attempt to safeguard the population and their property. As nobody received Napoleon he sent his aides into the city, seeking out officials with whom the arrangements for the occupation could be made. When none could be found it became clear that the Russians had left the city unconditionally. In a normal surrender, the city officials would be forced to find billets and make arrangement for the feeding of the soldiers, but the situation caused a free-for-all in which every man was forced to find lodgings and sustenance for himself. 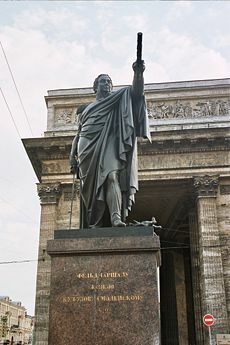 Napoleon was secretly disappointed by the lack of custom as he felt it robbed him of a traditional victory over the Russians, especially in taking such a spiritually significant city. Before the order was received to evacuate Moscow, the city had a population of approximately 270,000 people. As much of the population pulled out, the remainder were burning or robbing the remaining stores of food to deprive the French of their use. As Napoleon entered the Kremlin, only one third of the original population remained in the city, mainly consisting of foreign tradespersons, servants, and people who were unable or simply unwilling to flee. These attempted to avoid the troops, including the several hundred strong French colony. After entering Moscow, the Grande Armée, unhappy with military conditions and no sign of victory, began looting what little remained within the city. Already the same evening, the first fires began to break out, spreading and reemerging over the next few days. Two thirds of Moscow was comprised of buildings made of wood. It burnt down almost completely (it was estimated that four-fifths of the city was destroyed), effectively depriving the French of shelter in the city. French historians assume that the fires were due to Russian sabotage. Leo Tolstoy, in War and Peace, claimed that the fire was not deliberately set, either by the Russians or the French, but was the natural result of placing a wooden city in the hands of strangers in wintertime. He speculated that the cause was the quite natural need of the invading army to make small fires to stay warm, cook their food, and other benign purposes, with the inevitable consequence that some of those fires got out of control. Without an efficient Fire Department, those house fires likely spread to become neighborhood fires and ultimately a city-wide conflagration. "In 1812," by Illarion Pryanishnikov. French Army in the Town Hall Square of Vilnius during the retreat. Sitting in the ashes of a ruined city without having received the Russian capitulation and facing a Russian maneuver forcing him out of Moscow, Napoleon started his long retreat by the middle of October. 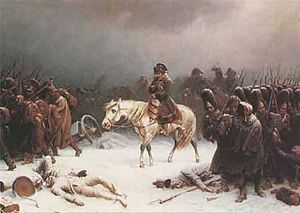 At the Battle of Maloyaroslavets, Kutuzov was able to force the French army into using the very same Smolensk road on which they had earlier moved East and which had already been stripped of food supplies by both armies. This is often presented as an example of scorched-earth tactics. Continuing to block the southern flank to prevent the French from returning by a different route, Kutuzov again deployed partisan tactics to constantly strike at the French train where it was weakest. Light Russian cavalry, including mounted Cossacks, assaulted and broke up isolated French units. Supplying the army became an impossibility; the lack of grass weakened the army's remaining horses, almost all of which died or were killed for food by starving soldiers. With no horses the French cavalry ceased to exist, and cavalrymen were forced to march on foot. In addition the lack of horses meant that cannons and wagons had to be abandoned, depriving the army of artillery and support convoys. Although the army was quickly able to replace its artillery in 1813, the abandonment of wagons created an immense logistical problem for the remainder of the war, as thousands of the best military wagons were left behind in Russia. As starvation and disease took their toll the desertion rate soared. Most of the deserters were taken prisoner or promptly executed by Russian peasants. Badly weakened by these circumstances, the French military position collapsed. Elements of the Grande Armée were defeated by the Russians at Vyazma, Krasnoi, and Polotsk. The crossing of the river Berezina was the final French catastrophe of the war, as two separate Russian armies inflicted horrendous casualties on the remnants of the Grande Armée as it struggled to escape across pontoon bridges. 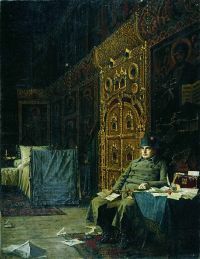 Bad News from France, painting depicting Napoleon encamped in a Russian Orthodox church (Vasily Vereshagin, part of his series, "Napoleon, 1812," 1887–1895). In early December 1812 Napoleon learned that General Claude de Malet had attempted a coup d’état back in France. He abandoned the army and returned home on a sleigh, leaving Marshal Joachim Murat in charge. Murat later deserted in order to save his kingdom of Naples, leaving Napoleon's former stepson, Eugene de Beauharnais, in command. In the following weeks, the remnants of the Grande Armée were further diminished, and on December 14, 1812 they were expelled from Russian territory. According to the popular legend only about 22,000 of Napoleon's men survived the Russian campaign. However, some sources do not mention more than 380,000 soldiers killed. The difference can be explained by up to 100,000 French prisoners in Russian hands (mentioned by Eugen Tarlé, released in 1814) and more than 80,000 (including all wing-armies, not only the rest of the "main army" under Napoleon's direct command) returning troops (mentioned by German military historians). Most of the Prussian contingent, for example, survived thanks to the Convention of Tauroggen, and almost the whole Austrian contingent under Schwarzenberg withdrew successfully as well. The Russians formed the Russian-German Legion from other German prisoners and deserters. Russian casualties in the few open battles are comparable to the French losses, but civilian losses along the devastated war path were much higher than the military casualties. In total, despite earlier estimates giving figures of several million dead, around one million were killed including civilians–fairly evenly split between the French and Russians. Military losses amounted to 300,000 French, about 72,000 Poles, 50,000 Italians, 80,000 Germans, 61,000 from other nations. As well as the loss of human life the French also lost some 200,000 horses and over 1,000 artillery pieces. The overall losses of the Russian armies are hard to assess. A nineteenth century historian Michael Bogdanovich assessed reinforcements of the Russian armies during the war using Military Registry archive of the General Staff. According to this source, the reinforcements totaled 134,000. The main army at the time of capture of Vilna in December had 70,000 men, while its number at the war start was about 150,000. Thus, the total loss is 210,000 men. Of these about 40,000 returned to duty. Losses of the formations operating in secondary areas of operations as well as losses in militia units were about 40,000. Thus, he came up with the number of 210,000 men and militiamen. One study concluded the winter only had a major effect once Napoleon was in full retreat: "In regard to the claims of "General Winter," the main body of Napoleon's Grande Armée diminished by half during the first eight weeks of his invasion before the major battle of the campaign. This decrease was partly due to garrisoning supply centers, but disease, desertions, and casualties sustained in minor actions caused thousands of losses. At Borodino…Napoleon could muster no more than 135,000 troops, and he lost at least 30,000 of them to gain a narrow and Pyrrhic victory almost 1000 km deep in hostile territory. The sequels were his uncontested and self-defeating occupation of Moscow and his humiliating retreat, which began on October 19, before the first severe frosts later that month and the first snow on November 5. The Russian victory over the French army in 1812 marked a huge blow to Napoleon's ambitions of European dominance. The Russian campaign was the decisive turning-point of the Napoleonic Wars that ultimately led to Napoleon's defeat and exile on the island of Elba. For Russia the term Patriotic War (an English rendition of the Russian Отечественная война) formed a symbol for a strengthened national identity that would have great effect on Russian patriotism in the nineteenth century. The indirect result of the patriotic movement of Russians was a strong desire for the modernization of the country that would result in a series of revolutions, starting with the Decembrist revolt and ending with the February Revolution of 1917. The importance of the Patriotic War would once again be felt in the mid-twentieth century when Adolf Hitler broke the Molotov-Ribbentrop Pact and invaded the Soviet Union during World War II. Soviet premiere Joseph Stalin abandoned his communist rhetoric, adopting the more traditional rhetoric of "Mother Russia." In Soviet and Russian historiography, World War II is known as the "Great Patriotic War." Napoleon was not completely defeated by the disaster in Russia. The following year he would raise an army of around 400,000 French troops supported by a quarter of a million French allied troops to contest control of Germany in an even larger campaign known as the Sixth Coalition. Despite being outnumbered, he won a decisive victory at the Battle of Dresden (August 26-27, 1813). It was not until the decisive Battle of Nations (October 16–19, 1813) that he was finally defeated and afterwards no longer had the necessary troops to stop the Coalition's invasion of France. Napoleon did still manage to inflict heavy losses on the far larger Allied armies as they drove towards Paris, though they captured the city and forced him to abdicate in 1814. The Russian campaign, though, had revealed that Napoleon was not invincible, putting an end to his reputation as an undefeated military genius. Napoleon had foreseen what it would mean, so he fled back to France quickly before word of the disaster became widespread. Sensing this, and urged on by Prussian nationalists and Russian commanders, German nationalists revolted across the Confederation of the Rhine and Prussia. The decisive German campaign likely could not have occurred without the message the defeat in Russia sent to the rest of Europe. ↑ 1.0 1.1 Michael Bogdanovich. "History of Patriotic War 1812." (Saint Petersburg: 1859–1860), Appendix, 492–503. ↑ Richard K. Riehn, 1812: Napoleon's Russian Campaign (New York: Wiley, 1991, ISBN 0471543020), 10–20. ↑ 5.0 5.1 5.2 Riehn, 139. ↑ Robert K. D. Peterson, Typhus in Russia, reprinted and adapted from R. K. D. Peterson, 1995. Insects, disease, and military history: the Napoleonic campaigns and historical perception. American Entomologist 41:147-160. ↑ 10.0 10.1 10.2 10.3 10.4 10.5 10.6 10.7 10.8 Riehn, 81. Georges Lefebvre, Napoleon from Tilsit to Waterloo (New York: Columbia University Press, 1969, vol. II), 311–312. Felix Markham, Napoleon (New York: Mentor, 1963), 190, 199. James Marshall-Cornwall, Napoleon as Military Commander (London: Batsford, 1967), 220. Eugene Tarle, Napoleon's Invasion of Russia 1812 (New York: Oxford University Press, 1942), 397. Richard K. Riehn, 1812: Napoleon's Russian Campaign (New York: John Wiley, 1991), 77 and 501. ↑ 16.0 16.1 16.2 Riehn, 88. ↑ 25.0 25.1 Riehn, 167. ↑ 26.0 26.1 Riehn, 168. ↑ 27.0 27.1 27.2 Riehn, 169. ↑ 28.0 28.1 28.2 28.3 Riehn, 170. ↑ 29.0 29.1 Riehn, 171. ↑ The Wordsworth Pocket Encyclopedia, (Hertfordshire, 1993, ISBN 9781853263019), 17. ↑ Allen F. Chew, Fighting the Russians in Winter: Three Case Studies (US Army Command and General Staff College, ISBN 978-1780390208). Bogdanovich, Michael. History of Patriotic War 1812. St Petersburg, 1863. OCLC 25319830. Connelly, Owen. Blundering to Glory: Napoleon's Military Campaigns, 2nd edition, Wilmington, DE: SR Books, 1999. ISBN 0842027807. Lefebvre, Georges. Napoleon from Tilsit to Waterloo, 1807-1815. New York, NY: Columbia University Press, 1990. ISBN 978-0231073912. Marshall-Cornwall, James. Napoleon as Military Commander. London: Batsford, 1967. Nafziger, George. Napoleon's Invasion of Russia. Hippocrene Books, 1984. ISBN 0882546813. Riehn, Richard K. 1812 Napoleon's Russian Campaign. New York, NY: Wiley, 1991. ISBN 0471543020. Tarle, Eugene. Napoleon's Invasion of Russia 1812. New York, NY: Oxford University Press, 1942. Zamoyski, Adam. 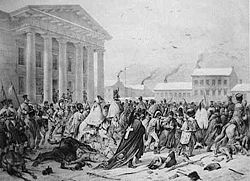 Moscow 1812: Napoleon's Fatal March. London: HarperCollins, 2004. ISBN 0007123752. Anthony, James Joes. "Continuity and Change in Guerrilla War: The Spanish and Afghan Cases." Journal of Conflict Sudies 16(2) (1996). University of New Brunswick. Chew, Dr. Allen F., "Fighting the Russians in Winter: Three Case Studies.". US Army Command and General Staff College. (Dec. 1981) Leavenworth Papers US ISSN 0195 3451. Retrieved January 22, 2009.
von Brandt, Heinrich. In the Legions of Napoleon; The Memoirs of a Polish Officer in Spain and Russia, 1808-1813. Translated and edited by Jonathan North. London: Greenhill Books, 1999. ISBN 1853673803. Chandler, David G. The Campaigns of Napoleon. Folio, 2002. ISBN 0297748300.
von Clausewitz, Karl. The Campaign of 1812 in Russia. New Foreword by Gerard Chaliand. Watertown, MA: Blue Crane Books, 1996. ISBN 978-0962871580. Davidov, Denis. In Service of the Tsar Against Napoleon, 1806-1814. London: Greenhill Books, 1999. ISBN 1853673730. Ryan, Edward. Napoleon's Elite Cavalry. London: Greenhill Books, 1999. ISBN 1853673714. History of "French invasion of Russia"